Wat is dit voor site? Wij zoeken de goedkoopste boeken op internet. Natural Language Processing and Information Systemsvonden we het goedkoopst op Bol.com voor €85.99. We hebben gezocht in nieuwe en tweedehands boeken. Rechtsonderaan de pagina kan je het boek direct bestellen	via Bol	.com. 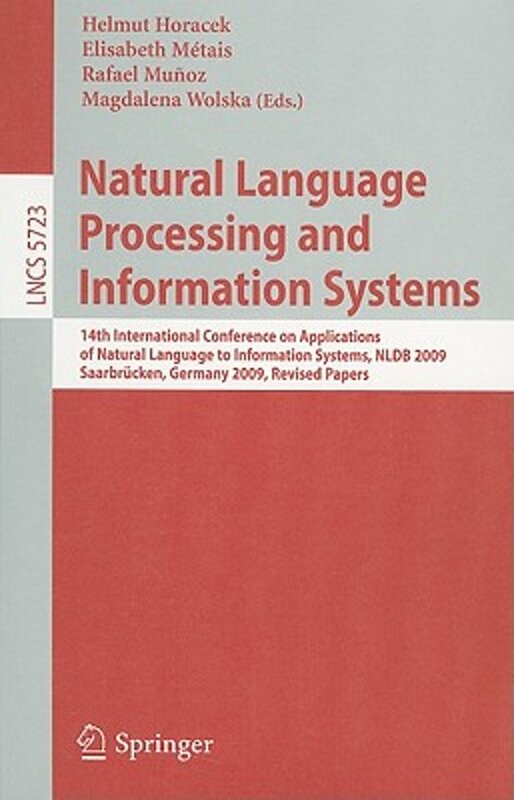 This volume contains the papers presented at NLDB 2009, the 14th Inter- tional Conference on Applications of Natural Language to Information Systems held June 24-26, 2009, at the University of the Saarland and the German - search Center for Arti?cial Intelligence in Saarbruc ken, Germany. In addition to reviewed submissions, the program also included contributions to the doctoral symposiumheldduring NLDB2009aswellastwoinvitedtalks.Thesetalksc- ered some of the currently hot topics in the use of natural languagefor accessing information systems. Wereceived51submissionsasregularpapersforthemainconference,2extra submissions as posters, and 3 short papers for the doctoral symposium. Each paper for the main conference was assigned four reviewers, taking into account preferences expressed by the ProgramCommittee members as much as possible. Within the review deadline, we received at least three reviews for almost all submissions. After the review deadline, the Conference Organizing Committee members and the Program Committee Chair acted as meta-reviewers. This task included studying the reviews and the papers, speci?cally those whose assessment made them borderline cases, and discussing con?icting opinions and their impact on theassessmentofindividualpapers.Finally,themeta-reviewerswroteadditional reviews for the few papers which received less than three reviews, as well as for papers which received reviews with considerably con?icting assessments.